Tokara restaurant celebrated one year of operation with chef Richard Carstens in charge of the kitchen, on Fri 28th October. They launch their new summer menu next week. Impressions? Savoury ice-creams may be one of Carstens’ signature items but I’ll never be a fan. I simply can’t appreciate a frozen savoury ingredient partnered with sugar, despite trying plenty of variations. So sweet meringue of baked Alaska over succulent, beautiful rainbow trout with citrus salsa and cucumber, with ginger, soya and mirin, had impressive elements in part. But a scoop of smoked salmon ice cream was one step too sweet, and killed the beautiful bottle-aged leanness of Tokara Sauvignon Blanc 2010. 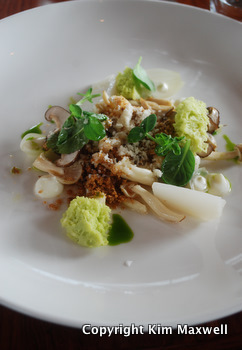 A tumble of subtle tastes and textures in assorted mushrooms under crunchy crumbles (somebody suggested the shrooms had been marinated in Tokara Chardonnay), amazingly zingy turnip contrasting fresh pear, with garlic creme, macadamias and goat’s milk cheese. Bits of pea “sponge” took the plate into a cheffy realm, while Tokara Chardonnay dressing added richness in just the right amount. A truly outstanding dish. But then Richard’s wife Tracy is a vegetarian with gourmet tastes. He’s had plenty of practice perfecting this side of a menu. It’s a talent he should highlight more. TOKARA RESTAURANT Helshoogte Pass, Stellenbosch. Tel 021 885 2550, Tokara. kinds of familiarity, so it's good to read this weblog, and I used to visit this web site daily.